NRCL of HIV at the NCIPD provides confirmatory diagnostics and virological monitoring of patients with HIV/AIDS in Bulgaria. NRCL of HIV is the only reference laboratory in the country that provides the final confirmatory diagnostics of HIV and register persons infected with HIV. The laboratory performs wide range of diagnostics and confirmatory tests including: 4th generation ELISA Ag/Ab, confirmatory test WB, p24Ag, Real-time PCR, sequencing of the viral genome and rapid tests for HIV. For pregnant women and newborns, laboratory conducts serological and molecular biological analysis for HIV diagnostics and virological control. NRCL of HIV conducts analysis for early HIV infection and late presenters to monitor the development of the epidemic in the country. As part of the patients follow up and to monitor the success of antiretroviral therapy, NRCL of HIV provides tests for viral load with Real-time PCR as well as resistance tests to ARV therapy by sequencing and genotyping fragment of the viral genome. NRCL of HIV is a reference laboratory of the NCIPD and holds annual national inter-laboratory control for laboratories in Bulgaria that performs HIV tests. NRCL of HIV participates in international inter-laboratory control conducted by INSTAND, Germany - Quality Assurance and Standardization in Laboratory Medicine. Control subject: serological markers and tested methods for HIV infection, including ELISA Ag/Ab, p24Ag, confirmatory test WB; molecular-biological methods, including viral load by Real-time PCR and resistance tests to antiretroviral drugs, by sequencing and genotyping of the viral genome. NRCL of HIV provides training for students, biologists, medical and laboratory experts and postgraduate as part of the training for Clinical Microbiology, Virology and Epidemiology and other specialties. NRCL of HIV provides training programs for graduate and PhD students. NRCL of HIV participates in expert groups to develop national guidelines for diagnosis and treatment of persons with HIV/AIDS in Bulgaria.In implementation of the objectives and tasks of the "National Programme for Prevention and Control of HIV/AIDS and sexually transmitted infections" NRCL of HIV participates in anti-AIDS campaigns to promote the prevention to limit the spread of HIV/AIDS and sexually and blood borne infectious diseases. NRCL of HIV provides trainings for collaborators of NGOs and Regional Health Inspectorate to provide services for voluntary counselling and testing for HIV in low-threshold canters for health and social services to persons from groups at highest risk. NRCL of HIV participates in national and international scientific studies and projects to monitor HIV drug resistance and introduction and spread of different HIV genotypes inBulgaria and other European countries. 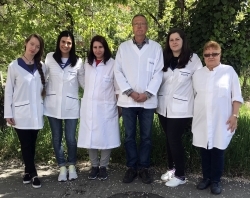 Laboratory of HIV participates in national and international congresses and collaborates with other laboratories and research institutes in Bulgaria and other countries. Ivailo Alexiev, Alessandra Lo Presti, Reneta Dimitrova, Brian Thomas Foley, Anna Gancheva, Asya Kostadinova, Lora Nikolova, Silvia Angeletti, Eleonora Cella, Ivaylo Elenkov, Mariana Stoycheva, Daniela Nikolova, Tsetsa Doychinova, Liliya Pekova, Massimo Ciccozzi. Alexiev I, Alexandrova M, Golkocheva-Markova E, Teoharov P, Gancheva A, Kostadinova A, Dimitrova R, Elenkov I, Chervenjakova T, Stoycheva M, Nikolova D, Varleva T, Nikolova M.
High Rate of Hepatitis B and C Co-infections among People Living with HIV-1 in Bulgaria: 2010-2014. AIDS Res Hum Retroviruses. 2016 Nov 14. [Epub ahead of print], doi:10.1089/AID.2016.0148. Gkikas Magiorkinis, Konstantinos Angelis, Ioannis Mamais, Aris Katzourakis, Angelos Hatzakis, Jan Albert, Glenn Lawyer, Osamah Hamouda, Daniel Struck, Jurgen Vercauteren, Annemarie Wensing, Ivailo Alexiev, Birgitta Åsjö, Claudia Balotta, Ricardo J. Camacho, Suzie Coughlan, Algirdas Griskevicius, Zehava Grossman, Anders Horban, Leondios G. Kostrikis, Snjezana J. Lepej, Kirsi Liitsola, Marek Linka, Claus Nielsen, Dan Otelea, Roger Paredes, Mario Poljak, Elizabeth Puchhammer-Stöckl, Jean Claude Schmit, Anders Sönnerborg, Danica Staneková, Maja Stanojevic, Charles A.B. Boucher, Georgios Nikolopoulos, Tetyana Vasylyeva, Samuel R. Friedman, D.A.M.C. van de Vijver, G. Angarano, M-L. Chaix, A. de Luca, K. Korn, C. Loveday, V. Soriano, S. Yerly, M. Zazzi, Anne-Mieke Vandamme, Dimitrios Paraskevis. Ivailo Alexiev,Anupama Shankar, Reneta Dimitrova, Anna Gancheva, Asia Kostadinova, Pavel Teoharov, Elitsa Golkocheva, Maria Nikolova, Mariya Muhtarova, Ivaylo Elenkov, Mariyana Stoycheva, Daniela Nikolova, Tonka Varleva, and William M. Switzer. Origin and spread of HIV-1 in persons who inject drugs in Bulgaria. Lorenzo Gios, Massimo Mirandola, Igor Toskin, Ulrich Marcus, Sandra Dudareva-Vizule, Nigel Sherriff, Michele Breveglieri, Martina Furegato, Cinta Folch, Laia Ferrer, Alexandra Montoliu, Christiana Nöstlinger, Wim Vanden Berghe, Sharon Kühlmann-Berenzon, Inga Velicko, Sónia Dias, Barbara Suligoi, Vincenza Regine, Danica Stanekova, Magdalena Rosińska, Saulius Caplinskas, Irena Klavs, Ivailo Alexiev and Alexandru Rafila. L. Marije Hofstra, Nicolas Sauvageot, Jan Albert, Ivailo Alexiev, Federico Garcia, Daniel Struck, David A.M.C. Van de Vijver, Birgitta Åsjö, Danail Beshkov, Suzie Coughlan, Diane Descamps, Algirdas Griskevicius, Osamah Hamouda, Andrzej Horban, Marjo Van Kasteren, Tatjana Kolupajeva, Leondios G. Kostrikis, Kirsi Liitsola, Marek Linka, Orna Mor, Claus Nielsen, Dan Otelea, Dimitrios Paraskevis, Roger Paredes, Mario Poljak, Elisabeth Puchhammer-Stöckl, Anders Sönnerborg, Danica Staneková, Maja Stanojevic, Kristel Van Laethem, Maurizio Zazzi, Snjezana Zidovec Lepej, Charles A.B. Boucher, Jean-Claude Schmit and Annemarie M.J. Wensing on behalf of the SPREAD program. M. Casadellà, P. M. van Ham, M. Noguera-Julian, A. van Kessel, C. Pou, L. M. Hofstra, J. R. Santos, F. Garcia, D. Struck, I. Alexiev, A. M. Bakken Kran, A. I. Hoepelman, L. G. Kostrikis, S. Somogyi, K. Liitsola, M. Linka, C. Nielsen, D. Otelea, D. Paraskevis, M. Poljak, E. Puchhammer-Stöckl, D. Staneková, M. Stanojevic, K. Van Laethem, S. Zidovec Lepej, B. Clotet, C. A. B. Boucher, R. Paredes, and A. M. J. Wensing on behalf of the SPREAD programme. Ivailo Alexiev, Anupama Shankar, A.M.J. Wensing, Danail Beshkov, Ivaylo Elenkov, Mariyana Stoycheva, Daniela Nikolova, Maria Nikolova, William M. Switzer. Konstantinos Angelis; Jan Albert; Ioannis Mamais; Gkikas Magiorkinis; Angelos Hatzakis; Osamah Hamouda; Daniel Struck; Jurgen Vercauteren; Annemarie M.J. Wensing; Ivailo Alexiev; Birgitta Asjo; Claudia Balotta; Ricardo J. Camacho; Suzie Coughlan; Algirdas Griskevicius; Zehava Grossman; Andrzej Horban; Leondios G. Kostrikis; Snjezana Lepej; Kirsi Liitsola; Marek Linka; Claus Nielsen; Dan Otelea; Roger Paredes; Mario Poljak; Elisabeth Puchhammer-Stockl; Jean-Claude Schmit; Anders Sonnerborg; Danica Stanekova; Maja Stanojevic; Charles A.B. Boucher; Lauren Kaplan; Anne-Mieke Vandamme; Dimitrios Paraskevis. Ani Kevorkyan, Pavel Teoharov, Tinne Lernout, Nedyalka Petrova, Ralitsa Raycheva, Ivailo Ivanov, Pierre van Damme, and Mira Kojouharova. Frentz D, Van de Vijver DA, Abecasis AB, Albert J, Hamouda O, Jørgensen LB,Kücherer C, Struck D, Schmit JC, Vercauteren J, Åsjö B, Balotta C, Beshkov D,Camacho RJ, Clotet B, Coughlan S, Griskevicius A, Grossman Z, Horban A,Kolupajeva T, Korn K, Kostrikis LG, Liitsola K, Linka M, Nielsen C, Otelea D,Paraskevis D, Paredes R, Poljak M, Puchhammer-Stöckl E, Sönnerborg A, StanekovaD, Stanojevic M, Van Wijngaerden E, Wensing AM, Boucher CA; SPREAD Programme. Increase in transmitted resistance to non-nucleoside reverse transcriptaseinhibitors among newly diagnosed HIV-1 infections in Europe. Frentz D, van de Vijver D, Abecasis A, Albert J, Hamouda O, Jørgensen L,Kücherer C, Struck D, Schmit JC, Vercauteren J, Asjö B, Balotta C, Bergin C, Beshkov D, Camacho R, Clotet B, Griskevicius A, Grossman Z, Horban A, KolupajevaT, Korn K, Kostrikis L, Linka KL, Nielsen C, Otelea D, Paraskevis D, Paredes R,Poljak M, Puchhammer-Stöckl E, Sönnerborg A, Stanekova D, Stanojevic M, VandammeAM, Boucher C, Wensing A; SPREAD Programme. Patterns of transmitted HIV drug resistance in europe vary by risk group. Frentz D, Wensing AM, Albert J, Paraskevis D, Abecasis AB, Hamouda O,Jørgensen LB, Kücherer C, Struck D, Schmit JC, Åsjö B, Balotta C, Beshkov D,Camacho RJ, Clotet B, Coughlan S, De Wit S, Griskevicius A, Grossman Z, Horban A,Kolupajeva T, Korn K, Kostrikis LG, Liitsola K, Linka M, Nielsen C, Otelea D, Paredes R, Poljak M, Puchhammer-Stöckl E, Sönnerborg A, Stanekova D, StanojevicM, Vandamme AM, Boucher CA, Van de Vijver DA; SPREAD Programme. Alexiev I, Beshkov D, Shankar A, Hanson DL, Paraskevis D, Georgieva V,Karamacheva L, Taskov H, Varleva T, Elenkov I, Stoicheva M, Nikolova D, SwitzerWM. Detailed molecular epidemiologic characterization of HIV-1 infection inBulgaria reveals broad diversity and evolving phylodynamics. Abecasis AB, Wensing AM, Paraskevis D, Vercauteren J, Theys K, Van de VijverDA, Albert J, Asjö B, Balotta C, Beshkov D, Camacho RJ, Clotet B, De Gascun C, Griskevicius A, Grossman Z, Hamouda O, Horban A, Kolupajeva T, Korn K, Kostrikis LG, Kücherer C, Liitsola K, Linka M, Nielsen C, Otelea D, Paredes R, Poljak M, Puchhammer-Stöckl E, Schmit JC, Sönnerborg A, Stanekova D, Stanojevic M, StruckD, Boucher CA, Vandamme AM. HIV-1 subtype distribution and its demographicdeterminants in newly diagnosed patients in Europe suggest highlycompartmentalized epidemics. Stanojevic M, Alexiev I, Beshkov D, Gökengin D, Mezei M, Minarovits J, OteleaD, Paraschiv S, Poljak M, Zidovec-Lepej S, Paraskevis D.
HIV‑1 molecularepidemiology in the Balkans: a melting pot for high genetic diversity. AIDS Rev.2012 Jan-Mar;14(1):28-36. Review.PubMed PMID: 22297502. Ivanka Stankova,Kamelia Stanoeva,Anton Hinkov,Ivailo Alexiev,Petya Genova-Kalou,Radoslav Chayrov and Radka Argirova. Amino acid and peptide esters of abacavir: synthesis and activity against human immunodeficiency virus type 1 in cell culture. Santoro MM, Ciccozzi M, Alteri C, Montieri S, Alexiev I, Dimova I, Ceccherini-Silberstein F, Beshkov D, Rezza G, Perno CF. Characterization ofdrug-resistance mutations in HIV type 1 isolates from drug-naive and ARV-treatedpatients in Bulgaria. AIDS Res Hum Retroviruses. 2008 Sep;24(9):1133-8. Salemi M, Goodenow MM, Montieri S, de Oliveira T, Santoro MM, Beshkov D,Alexiev I, Elenkov I, Elenkov I, Yakimova T, Varleva T, Rezza G, Ciccozzi M.
TheHIV type 1 epidemic in Bulgaria involves multiple subtypes and is sustained bycontinuous viral inflow from West and East European countries. Polianova M, Alexandrov M, Sovová V, Simeonov K, Roussev R, Beshkov D,Todorov TG. A threshold level of gag expression is required for particleformation in rat cells transformed by avian retroviruses.